For those of you who have been keeping up with BURGERS AND BARBIE$: thank you so much for being patient with me. I know it’s been a minute sans post, but I’m here now, and trust me—you’re really gona like this one! 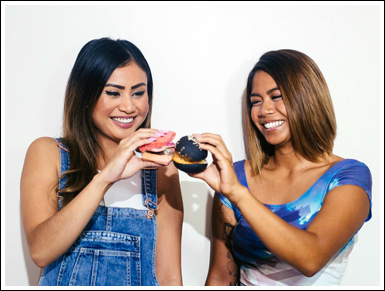 For the past couple of months, my trusty burger sidekick, Jessica, and I have been working our buns off (literally) putting together the city’s very first all-female run burger pop up called Burger Pawty. I must say that this was the event of my life! Words cannot describe how happy I was (and still am) about the outcome: everything was just how I envisioned it... it was perfect! But it’s needless to say that it has been quite a feat to get to that point. People often see the end result, but fail to recognize the journey... you ready? I’m a very ambitious person... I can admit that. 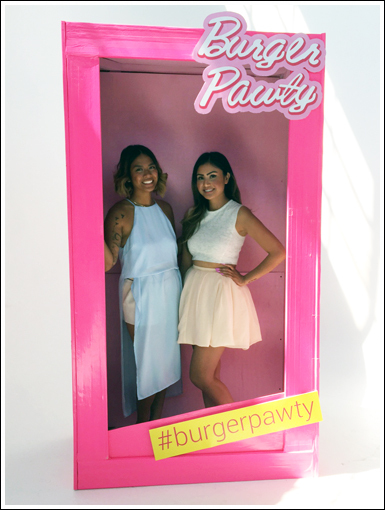 I’ve always wanted to organize a burger pop up, but there was always one thing in the way: this Barbie can’t cook! That’s where Jessica comes in. Last year, Jessica hosted her first pop up event at Propeller Coffee. I was initially invited as a media guest to cover the event on my blog, but due to the fact that there were no burgers on the menu, I could not commit to that post, but she encouraged me to come anyway. She told her culinary story through her food and girl, it was one of the best stories I’ve ever been told! I congratulated her on a successful event, and she suggested that we meet up one day for a private burger tasting. I was sitting at the 2015 Junior Achievement Company Program Awards Ceremony (yes, I’m a volunteer nerd), and about halfway through the event, the kids inspired me. They are so talented, innovative and bold... now what’s stopping me from reaching my own goals? Not. A. Damn. Thing. So I texted Jessica and decided to take her up on her offer. Then I added a little proposition of my own: a burger pop up! We finally set aside time to meet with one another and discuss the matter at hand. We agreed on a date that would best suit our schedules: August 22nd. We quickly set up an outline and timeline for the event, but first—what would we name this thing? 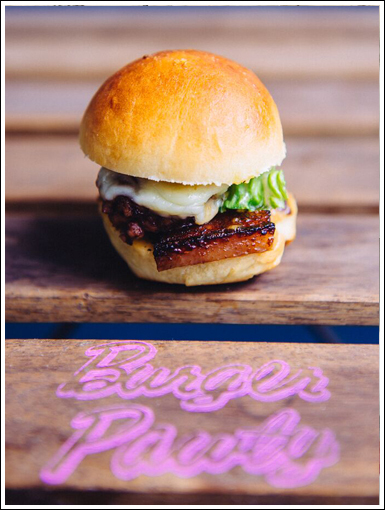 Burger Pop Up was too boring. We considered naming it Burger Date... too misleading. Finally, Burger Party popped into my head. It was Jessica who thought of adding the “w” to make it Burger Pawty, which worked in our favour, since the insty and Twitter handles weren’t taken, plus the hashtag was nonexistent (for now). From then on, the wheels kept on turning and never really stopped. The venue was the first thing we knew we had to lock down. Jessica was scouting places downtown, until she stumbled upon District 28. I didn’t even see this beauty in person before I told her that this absolutely needed to be our venue. We went to visit the spot a few days later, and the pictures online didn’t even do it justice! 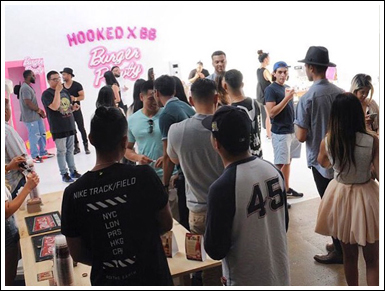 Our event took place in the lovely Studio 3, which served as a blank canvas for Burger Pawty. Next, we had to confirm a few vendors, so we could piece together our event. Andrea, aka Yuknodis was the first one on board to DJ our event, then we reached out to Olliffe Butcher to supply the meat for some of our burgers. We connected with Coco & Cowe Confectionery to provide the sweets, then Mill Street was the next vendor we confirmed for our event. But wait—there’s more! 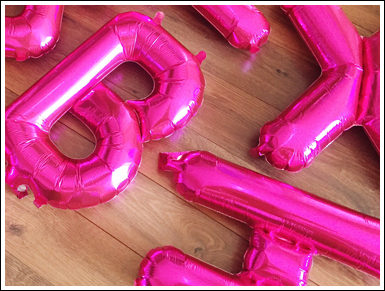 Just as we thought we had enough support from our local sponsors, we got Essentialist Media on board to provide us (and you) with some cool snaps to walk away with, as well as Hazel from HB Events with some gift bags! Another cool bonus: I attended a Mighty Angus Open Kitchen Flavour Session at the McDonald’s Head Office prior to this event, and the CPO of McDonald’s Canada herself handed me a ton of *free* Big Mac coupons to give away at our event… how cool! Now that we had everything sorted out, we could focus on the most important part: the food! Together, Jessica and I came up with a very special menu, sure to please the adventurous foodies attending the pawty. Two burgers represented Jessica and Hooked Co., and two burgers represented me and BURGERS AND BARBIE$. We knew we didn’t want to do fries for two reasons: too messy, and too predictable. If you don’t know what we served as a side... you’re straight outa luck! Just kidding... we’ll let you in on it. 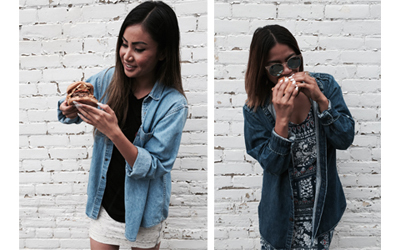 THE HOOKED BURGER: NEED WE SAY MORE? A hand pressed beef patty from Olliffe Butcher Shop, marinated tender pork belly, roasted garlic and sake caramelized onion aioli, crunch romaine lettuce, our secret Hooked sauce and aged cheddar cheese, on a toasted garlic bun. 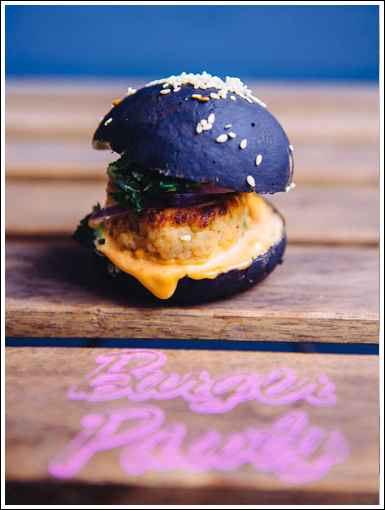 A homemade seafood patty of sesame basa fish and shrimp, cilantro avocado aioli, spicy coconut sauce, spinach and a pickled red onion and pineapple slaw, on a unique charcoal black bun. 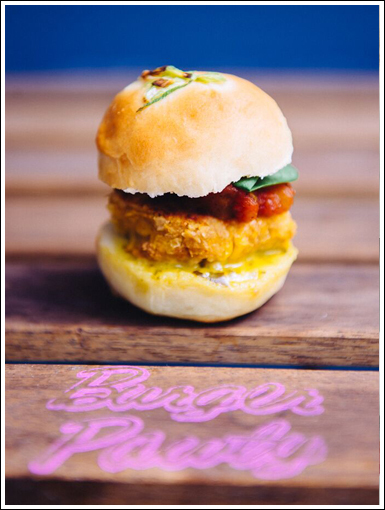 A spiced chickpea and sweet corn patty with a mango jalapeno lime sauce, roasted tomato jam and fresh arugula, served on a chive bun. 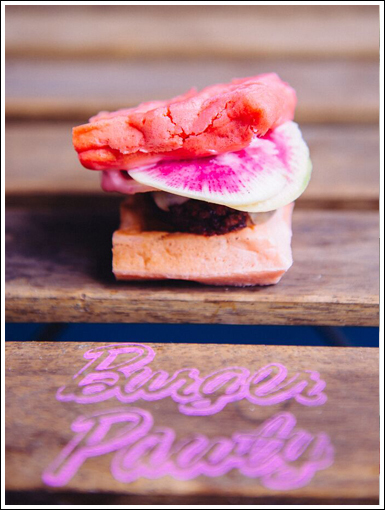 A hand pressed beef patty from Olliffe Butcher Shop, white aged cheddar cheese, pickled watermelon radish and our secret pink BURGERS AND BARBIE$ sparkle sauce, on a pink waffle bun. 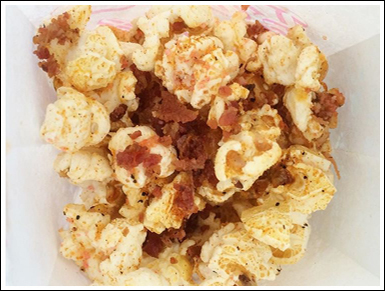 Savoury popcorn with a secret pink Hooked seasoning, parmesan cheese, crispy bacon bits, fresh chives and sesame seeds... these were a HIT! It was finally time! All the countless late nights and early mornings were finally going to pay off. To be honest, this day was such a blur... since Jessica was busy cheffin’ it up in the back half the time, I was in the event space, making sure things were running smoothly—or as smoothly as possible. I just remember introducing myself to a lot of new faces, schmoozing some old friends, answering a lot of questions (specifically: “So what is it that you do for Burger Pawty?” I’m the creative director, folks!) and trying my best not to eat the food (I have braces and I’m self-conscious about getting food stuck in them). Food aside, we also had a mini gallery, called STUDIO that showcased artwork from local female artists. This was one of my favourite things about Burger Pawty. 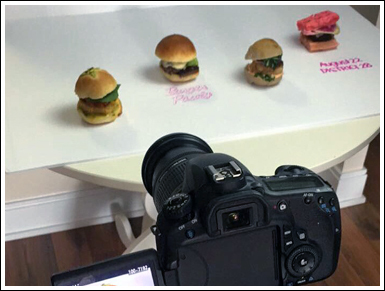 STUDIO only held about seven pieces total, but they told a story about women, burgers, Barbies, and more. 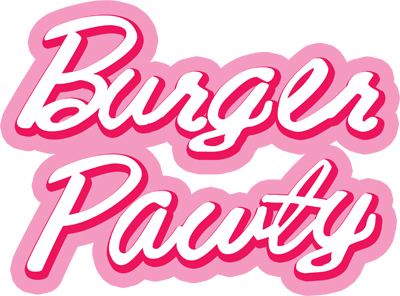 As mentioned in my foreword, “Burger Pawty in itself is a celebration and testament to all women: for their talent, their art, and for simply being.” That’s exactly what Jessica and I had envisioned, and if I may say so, I think we pulled it off! ps. Jessica's daughter, Maddy, even contributed a piece to STUDIO. So what’s next? This is something Jessica and I ask one another over and over again. Within a week, we got approached with three really cool gigs! One of which, unfortunately, we had to say no to, since we don’t quite have the manpower for it... but the other two gigs (announced on our insty) were more than what we could’ve asked for. In addition to that, we also have a little surprise in the works for y’all... just wait on it! The momentum is definitely strong and we’re both so, so excited for what’s to come.